It’s been some time since I’ve shown up in your inbox but doesn’t mean important education news hasn’t continued to break around the country. An exciting new media project I’ve started called Our Schools, in collaboration with the Independent Media Institute, takes you to the frontlines of these stories – from communities in New Jersey to California – to report on the nationwide effort to privatize and undermine the public education system. I’ve been exposing the false promises of charter schools, voucher programs, and corporate-style reforms and spotlighting how communities are fighting back and often succeeding against the school privatization agenda. My reporting appears on major national news outlets including Salon, AlterNet, and Naked Capitalism. But the best way for you to keep up with this reporting is to subscribe at the Our Schools website. And please help support the project with a generous donation. Don’t call what Kentucky teachers just did a “wildcat” labor action, at least not when you’re speaking with Tim Hall. Hall, a classroom teacher at Shawnee High School in Louisville, answered my phone call as he was driving to the state capitol in Frankfort to protest the latest slate of education-related bills being considered in the legislature. He and hundreds of other teachers in Jefferson County Public Schools, the state’s largest school district that includes Louisville, called in sick, prompting the district to close schools for over 100,000 students. Hundreds of those teachers joined Hall at the state capitol. It was the third time in a week and the second day in a row that enough JCPS teachers called out sick to trigger a full district shutdown. The sick-out spread to four other districts that also had to close. But neither the state teachers’ union nor the local union for Jefferson County had anything to do with organizing the action. In fact, union leaders urged teachers to show up for work, preferring instead to have districts send small teams of teachers to lobby state lawmakers. The Kentucky teachers’ actions are the latest in what has become a wave of teachers using their collective power to influence legislation in state governments, but the sick-out in Kentucky is also a sign of how teacher protests are evolving. Teachers who once saw labor actions as effective tactical responses to attacks on their financial well-being are now understanding that their labor power is part of a broader strategy to even the playing field in a political landscape that is increasingly unequal. And there’s strong evidence they’re having an impact. The teachers, joined by parents and other public education activists, organized the sick-out action on social media sites including the Facebook page for JCPS Leads, which Hall helps facilitate. Teachers went back to work at one point, but then extended their protest to a fourth, fifth, and then a sixth day to ensure controversial bills were killed in the legislature. The roots of this year’s labor action are in last year’s statewide strike when teachers closed schools across the Bluegrass State to protest a new pension bill that would have put retirement earnings for new teachers at greater risk and shortchanged retirees and senior teachers. This year’s sick-out is different. First, teachers have a much broader array of targets for their protests. “We want a whole package of bills voted down,” Hall explained. 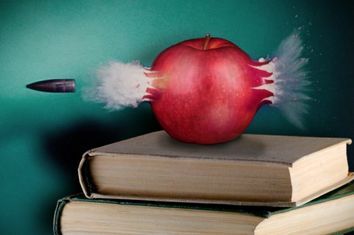 Once again, a threat to teachers’ pensions, House Bill 525, has stirred the teachers’ ire because it would reduce the participation of educators on the state employee pension board. But two other bills go beyond wage-and-benefits grievances: House Bill 205 that would establish a statewide school voucher program giving tax breaks to those who donate to private school scholarships for special-needs and low-income students, and Senate Bill 250 that would take school principal hiring decisions away from local, site-based committees, which include teachers, and give the district superintendent sole responsibility for the hiring process—the bill applies to JCPS only. Hall sees all three bills as attacks on democracy. “They’re about taking away our ability to collaborate on how our schools operate,” he said. By removing educators from the pension board, ramping up a statewide voucher program, and undermining teachers’ influence on principal hiring, teachers are being pushed further out to the periphery of decision making, he explained, and in turn, are less able to make their voices heard as advocates for their schools and their students. Also, there’s a good reason why Jefferson County teachers are taking it upon themselves to lead the labor action and go it alone in speaking out for their colleagues elsewhere in the state. Not only is JCPS the only district affected by the bill to change principal hiring; JCPS is also the only district currently under threat of state takeover. Proponents of charter schools and vouchers are generally seen as the most ardent backers of the takeover effort. And Hall and other teachers see all three bills as efforts to further undermine their participation in governance of their schools and usher in more state control and privatization of schools. In taking their demands beyond economic grievances to include issues of governance and local community voice, the Kentucky teachers are joining a strong new trend in the teacher movement. When West Virginia teachers walked off the job last year and started what’s become known as RedForEd, they generally made wages and benefits the core of their grievances. But in their labor action this year, West Virginia teachers expanded their protests to include issues with privatization, specifically, to fight new legislation that would take public money from traditional districts and use it for charter schools and for private and religious school tuition. Also this year, teachers in Los Angeles and Oakland, California, made opposition to the unchecked growth of charter schools and their lack of transparency and accountability a centerpiece of the unions’ demands. Education journalists and “experts” have noticed this trend and described it as mostly a battle over funding for public schools vs. charter schools, voucher programs, and other forms of privatization. But that misses the broader argument teachers make that all education mandates that stem from top-down authority and big money interests are meant to rob teachers of having a voice in how schools are governed. Teachers are making RedForEd a fight not just for funding but also for political power. There’s evidence that the teachers’ change in strategy will work. Last year’s RedForEd protests clearly affected state legislation where the protests occurred. According to a new analysis, in four states where teachers walked off the job, state legislatures responded by increasing baseline state funding for schools by 3-19 percent. This year, teacher strikes in Los Angeles and Oakland led to calls from local governments for moratoriums on new charters and increased regulation of the industry. In response, California state lawmakers acted with “lightning speed” to enact new laws that require more transparency in charter school operations. How successful were the Kentucky teachers? As of this writing, on the final day of the legislative session, two of the three bills teachers targeted in their protests appear to be dead—the bill restructuring the state pension board and the bill creating a statewide school voucher program. The bill targeting the principal hiring process in JCPS appears to have passed in both chambers and will likely be signed by Governor Matt Bevin. Two out of three is not a bad batting average in a “red state” where Republicans hold a trifecta of strong majorities in both branches of the state legislature and the governor’s seat. And should the dead bills come back to life, Hall assures me, or similar bills spring up, teachers will return to the capitol. To learn more about school privatization, check out Who Controls Our Schools? The Privatization of American Public Education, a free ebook published by the Independent Media Institute. Click here to read a selection of Who Controls Our Schools? published on AlterNet, or here to access the complete text. In the very first day of the strike, teachers squelched new state legislation they objected to and then held out an additional day to ensure it would die. The day after schools reopened, the teachers got what they wanted—a “clean” bill increasing teacher pay five percent. This was a huge gamble for the teachers, not only because they risked a confrontation with the wealthy establishment that backs charters and vouchers but also because they could alienate the coalition of progressive activists who had supported teachers in the past but had never forcefully opposed charter schools. “There had been no widespread debate on charter schools in West Virginia until now,” Gary Zuckett tells me. Zuckett and the West Virginia Citizen Action Group (WVCAG) for which he serves as executive director gladly joined with other social, economic, and environmental justice movements across the state last year to back West Virginia teachers in their demands for a pay raise and a fix to the state’s broken public employee health program. But neither WVCAG nor the groups’ national affiliate People’s Action had ever before made opposition to school privatization a major policy point. “It’s true—at the national level, progressives don’t talk a lot about K-12 and charter schools,” says Ryan Frankenberry, executive director of the West Virginia Working Families Party, a hyper-local political party that backs candidates largely for their stances on social, economic, and environmental values and their opposition to big money in politics. So it was never a sure thing should West Virginia teachers make their stand on opposition to charters that the progressive coalition that backed last year’s strike would have their backs. When teachers began walking off the job across the country last year, their demands were similar to those that progressive policy activists have long supported, such as workers’ rights, higher wages, and better funding for public services like education. But for years, the politics of school privatization efforts have been confusing. Charters and school voucher programs have been falsely framed as a civil rights cause. Former President Barack Obama gave charter schools a big boost in his administration’s Race to the Top program. Popular Democratic politicians like New Jersey U.S. senator and presidential candidate Cory Booker have strongly backed voucher programs and taken campaign donations from the charter school industry. Progressive leaders like Vermont U.S. senator and presidential candidate Bernie Sanders have been vague on their views about charters. And progressive advocacy groups have either generally supported charters or declined to take a position. But in this year’s walkouts, teachers have raised the stakes in challenging progressives to come down firmly on their side to oppose further expansion of privatization efforts. Beginning with the strike in Los Angeles, teachers began adding opposition to charter schools to their other demands and making a case that these taxpayer-funded, privately operated schools are harmful to public schools. Progressive organizers in the state also can’t deny what they see and hear about the conditions in their public schools and how they’d be affected by the introduction of charters. As soon as the walkout in West Virginia resolved, a teacher strike in Oakland, California, quickly flamed up. That strike resembles the strike in Los Angeles in which teachers demanded better pay, smaller class sizes, more nurses, counselors and other support staff, as well as an end to the spread of charter schools. But the negative impact of charter schools is likely even worse in Oakland, where the charters enroll 30 percent of the students in the district and siphon over $57 million from the public schools. To further accommodate the charters, the district has announced plans to close 24 public schools. As the opposition to charters surges to the front of teacher strikes in Oakland, a new bill swiftly moving through the state legislature, with the strong backing of Governor Gavin Newsom, will tighten oversight of charter schools and demand more financial transparency of them. The growing conflict and sharply contrasting points of view will likely pressure political candidates and progressive activists on the left to take sides. He concedes, however, there are still unresolved issues in how progressives will coalesce on charters elsewhere. His progressive colleagues in states with lots of charters still feel an urge to not totally reject charters because parents whose children attend the schools are often from marginalized communities. And teachers who work in charters are potential targets for labor unions who want to organize the workers. A Denver Public Schools teacher pay stub from 2016 shows the complexity of teacher salaries in the district. “I definitely drank the education reform kool-aid,” recalls Alex Nelson, a Denver teacher who, along with over 5,300 fellow teachers and school support staff, walked off the job earlier this month in a four-day strike that resulted in the teachers having most of their demands met. Now in his sixth year at Denver Public Schools, Nelson is at Bryant-Webster Elementary where he teaches Math, Science, and Spanish to third- and fourth-grade students. “I was convinced education was failing and needed reform,” he recalls about his early years in the profession. Back then, Denver schools were still basking in the glow of favorable national media coverage received during the leadership of superintendent, and now current U.S. Senator and expected presidential candidate, Michael Bennet. Under Bennet’s direction from 2005-2009, Denver adopted a package of policies and programs favored by bipartisan education reformers, including measuring school and teacher performance by student test scores, closing low-performing schools, and opening competitive charter schools. After Bennett’s tenure, district leadership transitioned to protege Tom Boasberg who just finished a ten-year term in office maintaining most of the same policies Bennet started. Denver’s approach to school governance has been much-ballyhooed by politically centrist advocates like David Osborne of the Progressive Policy Institute, the Clinton-era “ideas shop” that has been pushing the privatization of public services for more than thirty years. Beltway-based think tanks, on both the right and the left of the political spectrum, hail Denver as a model to “transform” the education of low-performing students. And the Brookings Institution named Denver the second-best of the nation’s 100-plus largest school districts. The compensation system Nelson refers to is called ProComp, which linked teacher pay in part to student test scores and gave bonuses for things such as working in a high-poverty school or a hard-to-fill position. This year, one of the principal demands of the striking teachers was to scrap the system or at least drastically change it to resemble more of a traditional pay schedule where teachers can expect raises based on advanced degrees, additional responsibilities, and longevity. ProComp is a creation of the education reform ideology which believes that the reason low-income students struggle in schools is because teachers aren’t sufficiently financially incentivized to boost student test scores. Also, schools with large percentages of low-income students tend to have less experienced teachers who turn over more often, and financial incentives might correct for that inequity. But the experiences of Denver teachers show that the goals of basing teacher pay on student test scores and rewarding teachers for accepting challenging assignments are at odds with the reality teachers experience in their day-to-day work. Nelson, who like most other Denver teachers initially agreed to ProComp, now recalls he started to feel like something was wrong when he was teaching at a “tough school,” which was rated “ineffective” based on the test scores of the students, who were mostly low-income, non-white children. He noticed that his colleagues who taught in wealthier schools that were rated “effective” got bigger bonuses. “If you taught at a tough school, you were incentivized to leave it,” he says. The district set aside money to give additional bonuses to teachers in “highest priority” schools, “but no one understands the metrics for determining the highest priority schools,” Nelson says. There are only thirty schools with this rating, and should the school improve enough to come off the list, it’s not clear what happens to the bonus money. Also, Nelson says the compensation formula changed over time with fewer hoops and less money. 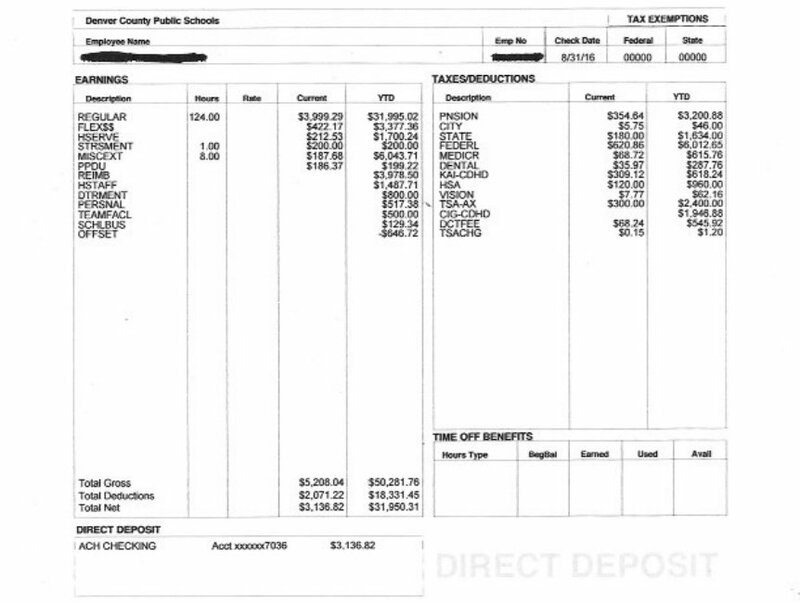 “The salary schedule is not transparent to the typical teacher,” he says. The result of this convoluted pay structure is that pay levels change so dramatically from month to month that, “when you go to get a loan, it’s hard to tell a bank what your base salary is,” he says. Due in part to the salary structure, and combined with the rising cost of living in a gentrifying city, teacher turnover rates in the district ballooned to well over 20 percent, with half of new teachers leaving the district within three years beginning in 2012. Teacher turnover rates were highest in schools where students had the greatest needs. Nelson recalls that in his first two years of teaching at that “tough school,” half of the staff turned over each year. District officials point to increasing proficiency rates on student standardized tests as proof reforms are working, but community advocates charge that district assessments of school performance levels are inflated, and Denver continues to have one of the worst achievement gaps between white and non-white students in the country. Research studies on the effects of Denver’s teacher salary system have found mixed results at best, both on its overall effects on student achievement levels as measured by test scores, and on teacher attrition rates. In their strike negotiations, Denver teachers argued successfully for base-pay increases, a more predictable salary schedule and to eliminate almost all pay-for-performance bonuses. And they compromised to accept the district’s proposal of a $3,000 annual bonus for working in hard-to-staff schools. They also won a demand to get a research study to examine the causes of teacher turnover in the district’s poorest schools. The agreement is expected to be ratified by a vote of the rank-and-file teachers. “A 20 percent teacher turnover rate is not what’s best for kids,” Nelson says. He and his colleagues say smaller class sizes and more mental and physical health supports for students would go further than any monetary bonus to serve the interests of students and keep their teachers in the classroom. To Nelson and his fellow teachers, for far too long, Denver has felt “like a lab for education reform, experimenting with a district that will rubber stamp anything presented to them by reform advocates.” They want the experiments to end. “Isn’t it reasonable to have some regulations on charters?” asked Ingrid King, a kindergarten and dual language teacher at Latona Avenue Elementary School in Los Angeles. She and two of her colleagues spoke to me from the picket lines during the recently resolved teacher strike in her city. When she and over 30,000 teachers and school personnel walked off the job, it closed the nation’s second-largest school system of nearly a half-million students for six days and filled the streets with huge protests. The strike ended when the district conceded to give teachers a 6 percent pay raise, limit class sizes, reduce the number of student assessments by half, and hire full-time nurses for every school, a librarian for every middle and high school, and enough counselors to provide one for every 500 students. But the concessions teachers won that will likely have the most impact outside of LA are related to charter schools. The teachers forced the district leader to present to the school board a resolution calling on the state to cap the number of charter schools, and the teachers made the district give their union increased oversight of charter co-locations — a practice that allows charter operations to take possession of a portion of an existing public school campus. Los Angeles Unified has 277 charter schools, the largest number of charter schools of any school district in the nation. The schools serve nearly 119,000 students, nearly one in five students. The vast majority of charters are staffed by non-union teachers. (Teachers at a chain of unionized charter schools in the city that joined district teachers on the strike are still on strike.) So the quick takefrom some is the teachers’ union made curbs on charter schools part of their demands because these schools are a threat to the union’s power. But when you talk to teachers, that’s not what they say. They tell you they want to curb charter school growth, not because it threatens their union, but because charters threaten the very survival of public schools. Latona teachers I spoke with described competition from surrounding charter schools as an existential threat to their school and an undermining influence on the public system. “Charter schools are popping up everywhere and siphoning money and taking away students from our public school,” said King. The “haves” these teachers referred to are the “more savvy” parents who take advantage of what many charters offer, including smaller class sizes and newer resources and technology. The disparity is especially acute when the charter is co-located on the same campus as an existing public school. Traci Rustin, a second-grade teacher, recalled that at a previous school where she worked, the charter co-located on the campus “had much fewer teachers and students of color.” The charter students had more abundant and newer technology, the school lunches were more nutritious, and the classroom supplies were up-to-date. And when students returned to the public school when the charter “didn’t work out,” the new technology and resources, along with the funding that had left her school, didn’t transfer back. Butala, who also previously worked at a school with a co-located charter, recalled when the charter moved in, her school immediately had to devise ways to place students in more crowded classrooms and share common areas — such as the playground and cafeteria. But it was never clear to her what the charter was being asked to share with her school. She watched the new charter lure students away from her school, often to see them return months later after the funding was lost. Latona is experiencing a similar fate. The school doesn’t have to deal with a co-located charter, but competition from surrounding charters has taken a toll on the school. The school’s student enrollment is virtually all Hispanic, with a quarter of the students being English language learners, and 90.6 percent are socioeconomically disadvantaged. Yet, despite this challenging student population, the school significantly outperforms the state on academic measures of English language arts and mathematics and has been steadily improving, boosting proficiency levels by 12 points in ELA and nearly 19 points in math on the most recent assessments. Nevertheless, Latona’s student enrollment has long been in decline, according to state data. In the 2017-18 school year, the school enrolled 170 students. Five years ago, it was 267; ten years ago, it was 336, and the student body was more racially diverse. The enrollment declines have resulted in the school having to let go support staff, such as counselors and nurses, who are essential to the health and well-being of the students. “Maybe if we had the resources and staff we need, we wouldn’t see so many parents transferring their students to charters,” Rustin conjectured. The argument Latona teachers make is not lost on parents, many of whom supported the teacher demands and joined them on the picket lines because they see how their schools are being slowly depleted of funding and resources due to charter school expansions. “We’re past the tipping point on charters in Los Angeles,” Julian Vasquez Heilig told me in a phone interview. Heilig is a professor at California State University, Sacramento and the author of numerous studies on the impacts of accountability-based and market-based education reforms. Heilig is not doctrinairely opposed to charter schools, as some proponents of charter schools accuse their critics of being. On the contrary, he formerly worked as an instructor in a charter school, was a charter school parent and donor, and at one point served as a charter board member. “But the situation has changed,” he stated. The “situation” he referred to is the long-held claim that charter schools, by their very nature, are a positive force in the public school system. The preferred narrative is that charter schools are just another form of “public” school, that competition from charters makes public schools up their game, and when “parents vote with their feet” and choose to transfer their children to charters, money that “follows the child” out of the public school has no negative effects on the remaining students because the school can adapt to a lower student head count. Heilig and other charter school critics argue that theory of charter schools in no way resembles the realities of charters on the ground. And striking teachers in Los Angeles have opened people’s eyes to that reality. “Now that class sizes and lack of resources and school support staff have grown intolerable in Los Angeles public schools, teachers are bringing the public’s attention to the reality of what charters have helped create,” Heilig explained. “Five years ago, we weren’t talking about the financial impact of charter schools. Meanwhile, poor performing charters have been allowed to proliferate in the state,” and the public is largely unaware of the negative impact this has on the public education system. Until now. Truth is, the financials of charter schools have never added up. Because charter operators often get permission to set up new schools wherever they want, “far too much of this public funding is spent on schools built in neighborhoods that have no need for additional classroom space,” Lafer concluded. While public school districts can’t build new schools unless increases in enrollment or an influx of school-aged children demands them, charter schools can make the case based on subjective arguments having nothing to do with numbers, and when local school boards deny charter applicants, charter operators can appeal to the county or state board that, more often than not, overrules the local board. Los Angeles is the poster person of having too many schools chasing after too few students. District enrollment peaked in 2004 at just under 750,000 and has been dropping ever since, not just due to the growth of charters. A combination of factors — including declining birth rates, population flight to the suburbs, the exorbitant cost of child care, and skyrocketing housing prices that discourage young couples from having children — has led to a steep decline in the population of school-aged children in the district. Another flaw of charter school financials is that they add layers of administrative and infrastructure costs that public schools are expected to pay for, even though public school budgets are already under stress, and government leaders are unwilling to provide new funding. “Charters contribute to the funding problems because we’re paying for two school systems,” argued Heilig: the local public one and the privately run charter ones operating like parallel districts to the local schools, with their own duplicative layers of administrative staff and infrastructure. “There’s an incredible amount of waste and inefficiency” in this arrangement. “Charter proponents aren’t acknowledging these problems,” Heilig said. Indeed, after news of the LA strike resolution spread, proponents of charter schools and choice responded angrily to limits put on charters. Nina Rees, president and chief executive of the National Alliance for Public Charter Schools, told the New York Times that placing a cap on the growth of charter schools is a constraint “we cannot stand for.” And U.S. Secretary of Education Betsy DeVos, an ardent fan of the charter industry, declared teachers’ unions were “the only thing standing in the way” of the spread of school choice. But the stark contrast of the rhetoric from charter school hardliners to the reasonable requests of Los Angeles teachers, like Ingrid King, changes a conversation that has long been one-sided and clouded in lofty claims about charters. “The strike has made me consider how charter school expansion is harming the city,” wrotecharter school teacher Riley McDonald Vaca in an op-ed for the Los Angeles Times after seeing how the strike played out. 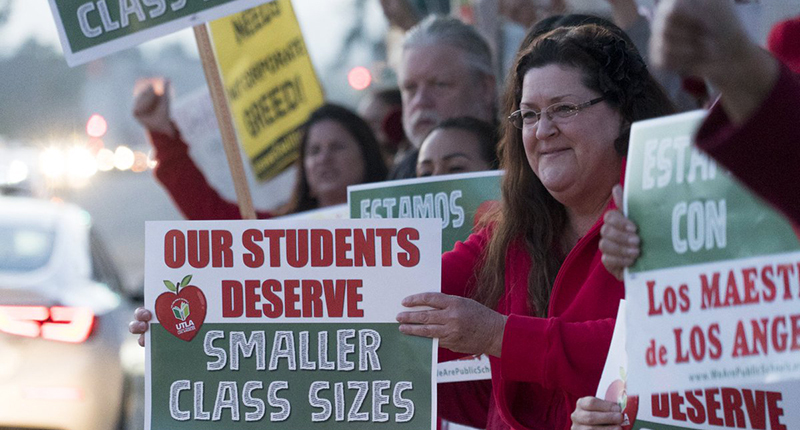 THIS WEEK: LA Teacher Strike … Charters Discriminate … #Red4Ed in 2019 … Dirty Secret of Ed Reform … Who Is Stifling Teachers? What Do Students Do When A For-Profit College Closes? A little more than six years ago, a group of public school advocates, political strategists, and progressive-minded educators from around the country met in an informal gathering in Washington, DC, to address the burning question of how to lead a resurgence in progressive values in education policy and politics. At the time, Republican state governors and legislators were engaged in a withering assault on public schools to strip them of financial resources they needed to educate a population of students increasingly wracked by poverty, homelessness, and the traumas of widespread racism and economic inequity. A Democratic presidential administration led by Barack Obama and his Secretary of Education Arne Duncan was continuing its campaign to ratchet down more pressure on schools and teachers to conform to practices most educators objected to and increase standardized test scores or face punitive actions. Influential billionaires and private foundations were stoking the coffers of political candidates and think tanks to back charter schools and other market-based forms of competition to public schools. And education policy makers and influential media pundits seemed stuck in a consensus that the nation’s public schools had failed and bad teachers were the problem. In the political arena, the progressive left had generally left the education battlefield to centrist Democrats and radical Republicans who more often than not agree on how schools should be governed. Public schools had virtually no prominent champions in the progressive faction on Capitol Hill, and progressive advocacy groups uniformly left education policy off their checklists of issues they cared about. Beginning with a bold “Education Declaration to Rebuild America,” EON set out a principled agenda based on the progressive ideals of public education as a primary vehicle to provide opportunities for individual advancement, promote social mobility, and share democratic values. The declared goal was to ensure all who envision a more just, progressive, and fair society joined in the fight for the public schools the nation deserves. Today, after nearly 300 newsletters, more than 360 articles and blogposts, a subscriber base of 60,000 education advocates, nearly a thousand reader comments, thousands of social media followers, and with a media reach that includes prominent national outlets, EON finds itself in a transformed education policy landscape. Teachers are engaged in massive protest actions to call attention to the lack of resources in schools and the needs for increased funding and relief from the obsession with standardized testing and harsh accountabilities. Grassroots advocacy by students, parents, and community organizers is starting to stymie the steady march of privatization in some communities and bring back democratic governance to school districts that had been deprived of voting rights for years. Prominent news outlets have gone from unfairly bashing classroom teachers to portraying their struggles with empathy. A new slate of Democratic governors has pledged support for traditional public schools and openly expressed skepticism of charter schools and other forms of privatization. And many of the progressive candidates who helped Democrats take back the US House of Representatives this fall vowed to support public schools rather than shutting them down and pledged to put the emphasis back on making neighborhood schools the best they can be rather than funding more alternatives that rarely live up to their promises. With the holidays approaching, EON will take stock of this transformation and take an extended break to reflect on where this project has been and where it should go from here. Your input in the comment section is welcome, or please leave a comment on the EON Facebook page where today’s newsletter is posted. Here’s wishing you the best of the season and seeing you back here in the New Year.